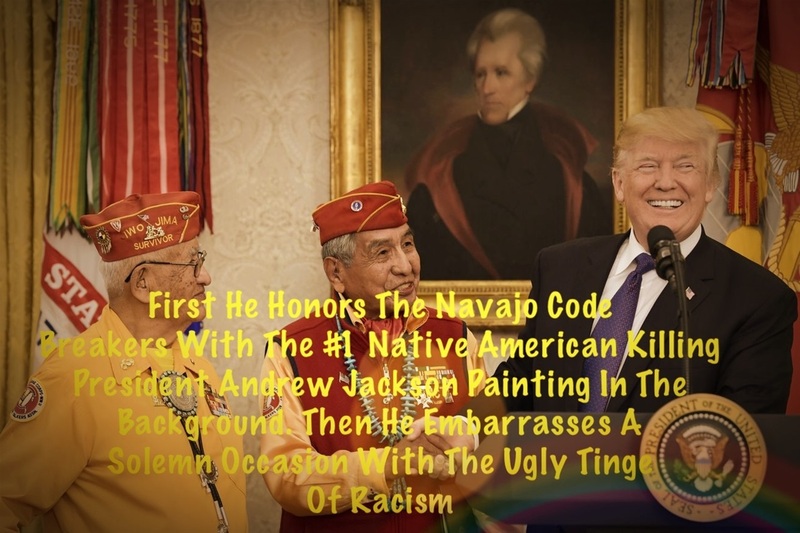 First, he honors the Navajo Native Americans and all Native Americans with some say the #1 Native American killing President's Andrew Jackson's portrait in the background. He didn't have anyone on his research team capable of selecting another room in the White House? Then he decides to integrate a little blatant racism in a supposed solemn celebration. Really, enough already dammit. Donald Trump's a natural born IDIOT who cannot and should not be given the opportunity to speak in a public forum without adult supervision. There also should be at least a 1 minute mute button on his microphone controlled by an outside unbiased person/organization. I don't care if you think he's your President or not, Trump is an absolute embarrassment to all intelligent people in this country. Even if unprovoked by eternal circumstances Donald Trump has shown an unrefined irresponsibility to totally embarrass this country. He doesn't have a needle within him to recognize his own stupidity. That's why his gravitational ignorance always pulls his actions and words to the utterly ridiculous level. Why in the name of holy hell would he take an opportunity to snipe at Senator Elizabeth Warren by referencing to her as Pocahontas during a solemn ceremony honoring World War 2 Navajo Code Talkers? I'm sorry but this individual doesn't deserve to hold the mantle as an elected representative of the United States. The time has arrived for some drastic steps to fix what a minority of Americans allowed to manifest itself last November. The action required is impeaching Donald Trump from the office of President. Although, I absolutely feel that Mike Pence is in many ways an absolutely crazy next guy up. I think we can at least sleep soundly at night knowing he'll not be thinking of ways to decimate the country and the world.